With tomorrow’s triggering of Article 50, a new phase of the post-Brexit immigration debate begins. Change is coming. This is a ‘reset’ moment, with significant reforms to Britain’s future immigration policy to come. Business voices seeking to defend the economic and social benefits of immigration for Britain have not, to date, been as effective as they need to be in that debate. Many appear not to have moved on since the referendum, saying ‘we accept the result and the changes it will bring,’ while appearing to seek as little change as possible or to carve out protections for their own sector. New approaches will be needed if they are to be successful, in the face of increased political and media pressure for a more restrictive approach. Repeating the same messages and the same mistakes that they made in the lead-up to 23 June will bare no more fruit than they did last year. Business must accept the challenge of securing political and public consent for the migration that Britain’s economy and society needs. 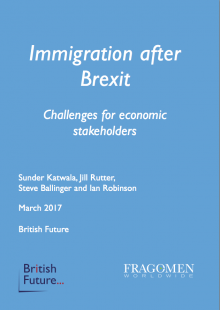 A new report today from British Future and Fragomen, Immigration after Brexit: Challenges for economic stakeholders, explores both the challenges facing business voices in the immigration debate and the strategies and approaches that may be more effective in meeting them. Reaching beyond those already onside and engaging new audiences who are sceptical-but-persuadable about the economic and social gains from immigration must be a key aim. This is a larger group than some might think: the public has more nuanced views on immigration than much of our polarised public debate suggests. Much of the public sees the new post-Brexit settlement as an opportunity to strike the right balance, with most people open to arguments about how to manage the pressures and secure the gains of immigration. How can business get a hearing from this audience? Not by battering them around the head with facts and figures about GDP, an approach that was tried and tried again in the referendum campaign, yet clearly came up short in terms of persuading the public. Nor will business persuade a sceptical public when they frame the debate as a trade-off between trade and immigration. Doing so risks characterising immigration as an issue of lesser importance, one that must play second fiddle to the serious business of the economy. That looks out-of-touch to a public that consistently ranks immigration alongside the NHS and the economy as the most pressing issues facing the country. And business will struggle to win support when it remains a voice only of critique and complaint. Economic actors should move beyond warnings about the dangers of an excessively restrictive approach. Instead, they will need to offer solutions that set out how the needs of business and the economy can be politically viable and can secure public consent too. A more constructive strategy would move on from the failed arguments of last year and embrace this new phase of the debate. It would start from the question of the right immigration system for Britain now that we are leaving the EU. It would articulate a clear and positive case for a system that can balance both the pressures and gains of immigration, engaging seriously with the concerns that people have and looking to rebuild confidence in the contribution that managed migration can make. A new approach to the skills debate is also needed. As Pret a Manger has recently found out to its cost, when business voices publicly criticise the quality or work ethic of British school-leavers in contrast to hard-working migrant workers, they risk exacerbating public concern that neither employers nor the Government are taking sufficient responsibility to fix the skills issue. Immigration after Brexit: Challenges for economic stakeholders offers advice to business voices in the immigration debate on how to move on from preaching to the converted about the frustrations of the current political and policy debate. Instead they must reach new audiences, both among decision-makers and the wider public, who are not already onside. And it also offers a hopeful message – that this is an achievable task. Public opinion is more moderate than they think – and a constructive argument, defending the economic gains of managed migration, will get a hearing during this important period of policy change.